I've been waiting for this for months (you guys have no idea) so I was stoked when I got the chance to review this. I love the cover and I found the plot really interesting. I don't usually go for scifi books but MILA 2.0 definitely lured me in. While the story didn't pick up immediately, I still appreciate how we were given a few chapters of normalcy before all the chaos commenced. I didn't like Mila very well in the beginning because I felt like she was rather bland. On some level her behavior was quite understandable because she lost her "dad" in as well as huge chunks of her "memory." I just wish there was a bit more umph to the way her thoughts were written, you know? Then we have Mila and Hunter - it was insta love... almost. Premature insta love is more like it. Before they even began their love story already took a really long break. I didn't get why the story had to include a love angle that seemed to evolve into something beyond a crush. I think the story would've still gone smoothly without it. I like the idea that Hunter's involvement was meant to show that Mila, despite being an android, was indeed capable of experiencing normal human feelings. But for Mila to obsess over Hunter till the very end? A tad too much. However, as far as showing that Mila was indeed becoming more and more human, I think Driza did a great job. Mila thought and acted like a regular teenager towards her mom, friends and even her crush. It actually became confusing for me when Mila found out that she wasn't human and she struggled to come to terms with everything. She got so upset at her "mom" for lying to her about everything but then again she didn't really have real memories to begin with. It was just so confusing and oddly enough I liked it. I felt how conflicted she was feeling. The thing that I liked most about MILA 2.0, was how action packed it was! Once I got past the weird insta love angle, I really couldn't get enough. I really enjoyed Driza's writing - there was never a dull moment once Mila and her mom started running. The pacing was great and the descriptions were so vivid. The story came to life with Driza's excellent writing. 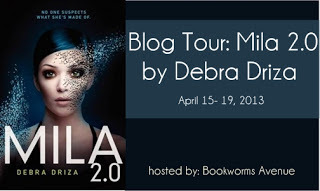 Debra Driza's thrilling debut novel opens a series that has a lot of promise. I liked this book overall and I'm looking forward to the next one, eager to see what else is in store. OMG I felt the same way about the romance! I just didn't think it was needed. I feel like the author just included it, because it's a YA book. Like you said, she was too obsessed with him and I was annoyed that Mila kept mentioning him throughout the WHOLE book. She only knew him for like a week or something. 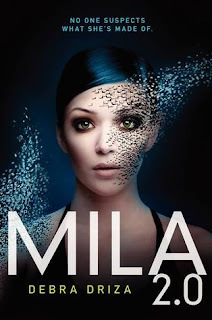 I also agree with you that the best thing about MILA 2.0 was that it was action-packed! There was so much crazy action stuff going on, I loved it. I think I gave it 3 stars too, or maybe 4, but it was definitely because the romance put a damper on how much I liked Mila as a character and the plot as a whole. There were also a few other points that I mentioned, though I don't remember now. Great review! Interesting. I was thinking about buying this book but I wasn't really sure. But since you mentioned that it was action-packed, maybe I will! I'm such a sucker for action, though a bit of good romance would be really nice. Good review! Mabuhay!